You may have heard that Mickey Mantle's, the Central Park South sports bar bearing the name of the Yankees legend (who was once an investor and frequent visitor), is closing. 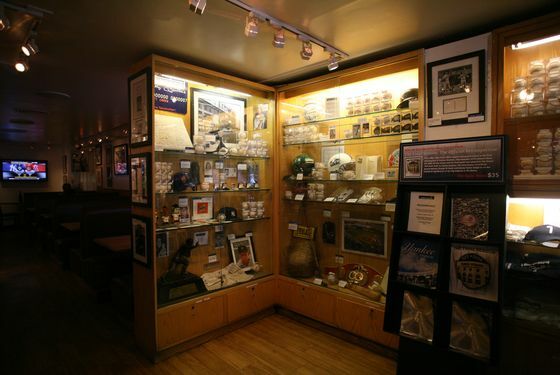 After months of failing to pay rent and making desperate fund-raising attempts to avoid bankruptcy, the restaurant was finally shuttered with all of its valuable sports memorabilia padlocked inside. Some of those artifacts got claimed by their respective donors well before the bankruptcy, but the rest of them — including countless autographs, photos, and even seats from the old stadium — are up for auction next week. Bankruptcy trustee Allan Mendelsohn said Appel wasn’t the only claimant trying to recover property culled from the restaurant where Mantle once held court. If their assertions are true, “they may have a claim to the fund from the proceeds of the auction,” the trustee said. So, Appel might get some of the money back for his belongings, but that doesn't seem to be the point. The point was that he spent time and effort assembling a collection of things he loved, generously offered those things to a struggling business, and now has to either watch his collection get unceremoniously dismantled (puns!) and sold or buy back his own property, which, from the sound of things, isn't something he's wont to do. It's not the end of the world. It's just another bummer on top of what was already a bummer of a story.